She is an activist for environmental issues and animal rights, especially elephants. We followed behind Praveen and Champaji’s auto. 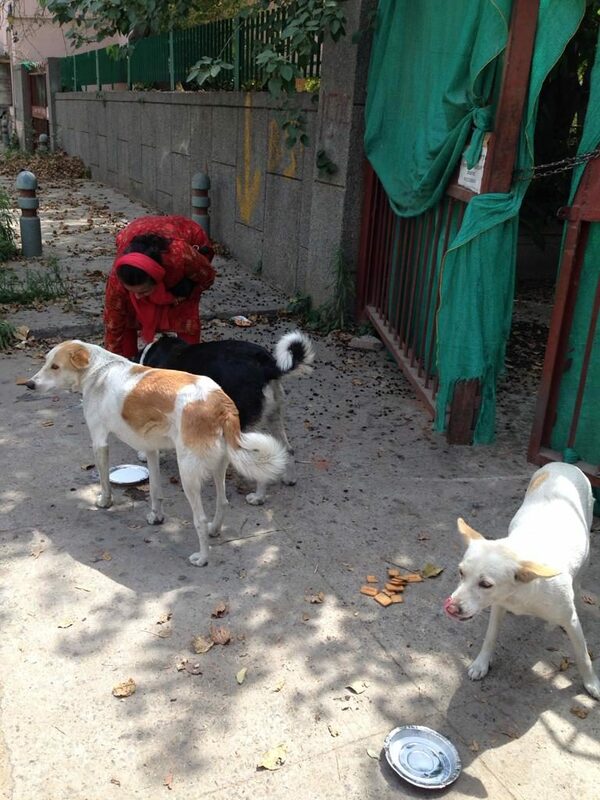 Whenever they stopped, a group of dogs and cats would come out, hungry, tails wagging. She says she takes care of 80-100 animals. Motu, alias Googly, is a large, sweet-natured, German shepherd mix who is getting on in years. 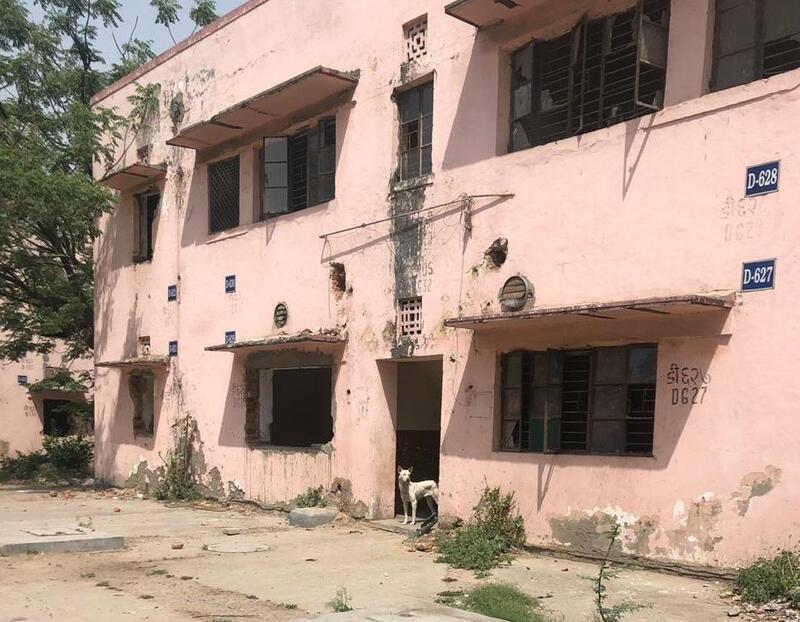 He was abandoned by his family, who like all the other community members, were evicted by the government to make way for NBCC to redevelop Netaji Nagar. 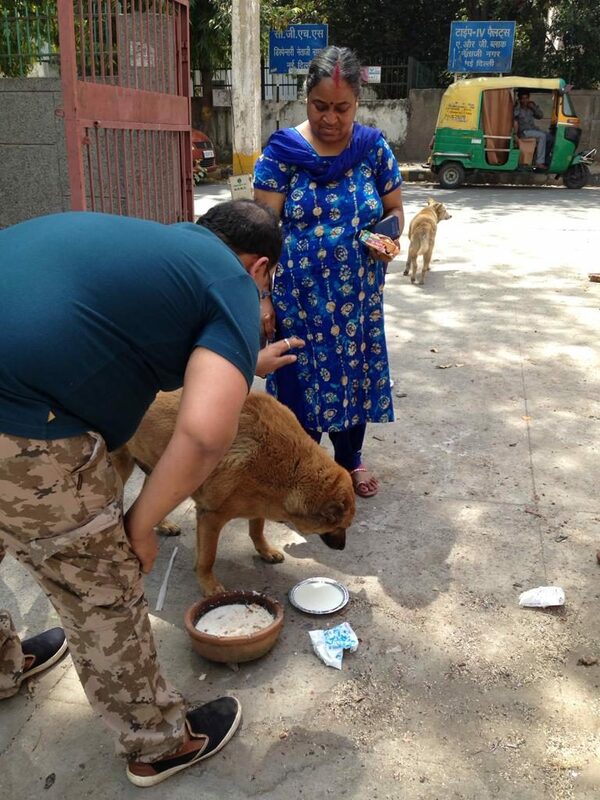 When metal demolition barricades surrounded Motu’s home, he left, along with a couple of his dog buddies and two cats, they all moved to the house next door. This is where Praveen feeds them. Motu and friends look very cheered to see Praveen and Champaji. The same story is repeated at many other stops. Some dogs have moved in with new guards, safeguarding salvaged fixtures. Mostly they look depressed and confused. 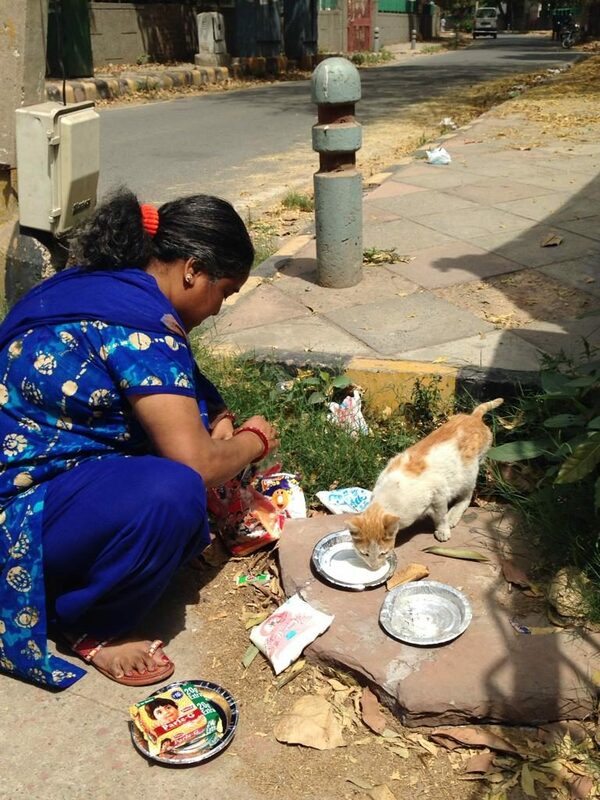 “Even the stray ones who subsisted on human garbage are starving,” says Champaji. She worries where the dogs and cats will go when full scale construction begins. This used to be a low key, charming, green haven, filled with many giant heritage trees. You can hear the echoes of a playful, rich, past resounding through the abandoned two-story flats – joyful children, joint families, gardens, friendly neighbours, busy vendors, chit-chatting helpers, like a vision of ghosts walking through what is now an empty ruin. Heaps of rubble cover the gardens, piles of salvaged fixtures leaning against familiar yellow walls. The dry buildings, burning almost white in the summer sun, stare back at us, empty, desolate with fractured holes for eyes, where the doors and windows have been mercilessly gutted out. It all looks somehow ominous -predicting some scary climactic future, hideous, and at the same time -piteous. Piteous, like the meows of a thin, white and cream, cat, rubbing against my trousers, for whom milk is not enough, she wants my touch, and my time. My attention. I am reminded suddenly how domestic animals are purely emotional in their connection with humans. In Delhi’s sweltering heat, this years summer came too soon, on the heels of only a few pleasant days, after another particulate-filled, dreadful polluted winter. We followed the auto stocked with biscuits, bread, milk, water and some paneer for the sickly ones. We looked for shady trees to park under, and we were relieved to do feedings under giant heritage peepul trees. And we were not the only ones there. 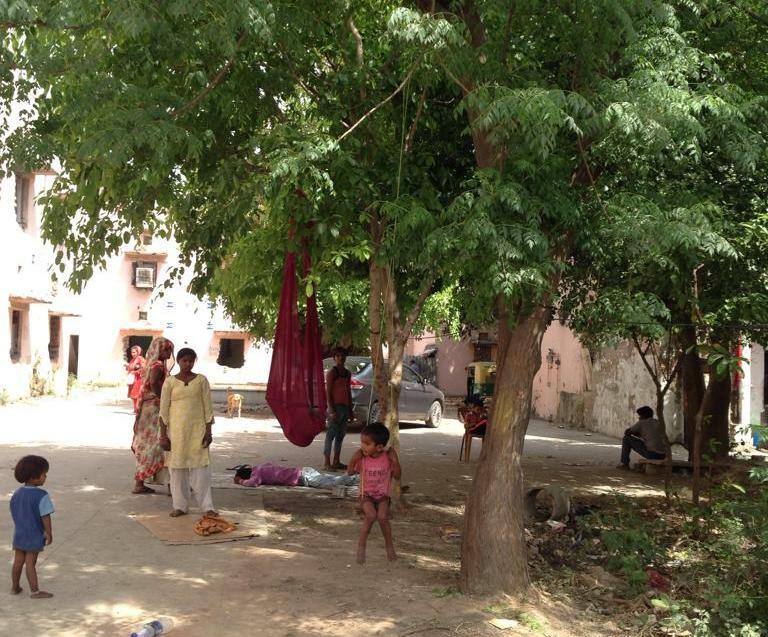 Even the families of the workers, doing the demolition, were resting in their leafy shade. Swings with their young ones, were being pushed by teenage mothers. These are the very trees that we agitated last year to save. 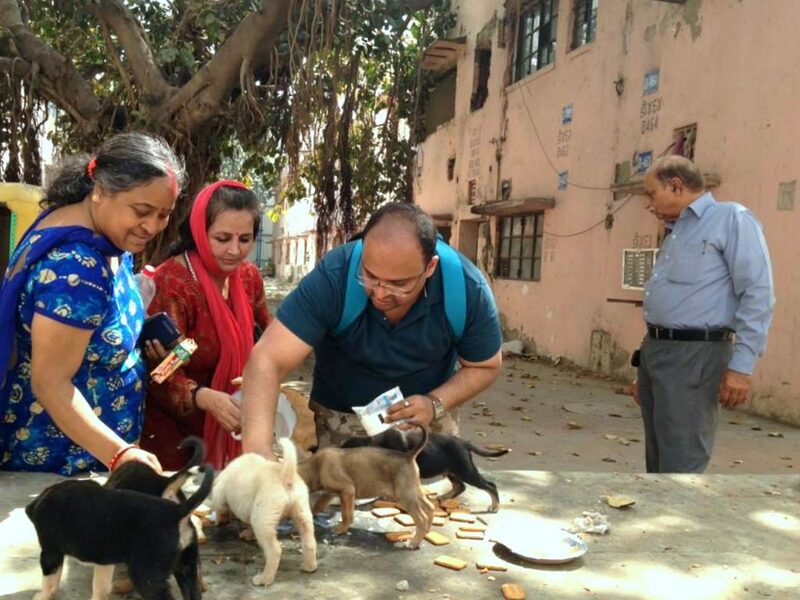 Delhi’s citizens came out in protest, last year, onto the streets of Sarojini Nagar, another of the 7 GPRA colonies suffering the same fate. 17,000 trees were to be felled for this grand redevelopment, public lands were to be converted to commercial to pay for it. No environmental assessments were done, in fact, they were plagiarised from other projects. The courts pulled up NBCC, and put a stay on the project, admonishing them for planning 80,000 parking spots and not doing any traffic assessments, in an area with two premier hospitals. Despite that, the doors and windows have been banged out of almost all the buildings. It looks like the project is going to start again, even without the new Environmental Impact Assessments. I am sure the excuse will be that the buildings are already unlivable now. Convenient and cruel, this development. In the flat barrenness left behind, one can just wonder how the trauma of so many evicted families has been made invisible. Like they never existed to begin with. But these dogs and cats remain as a testimony to the past. 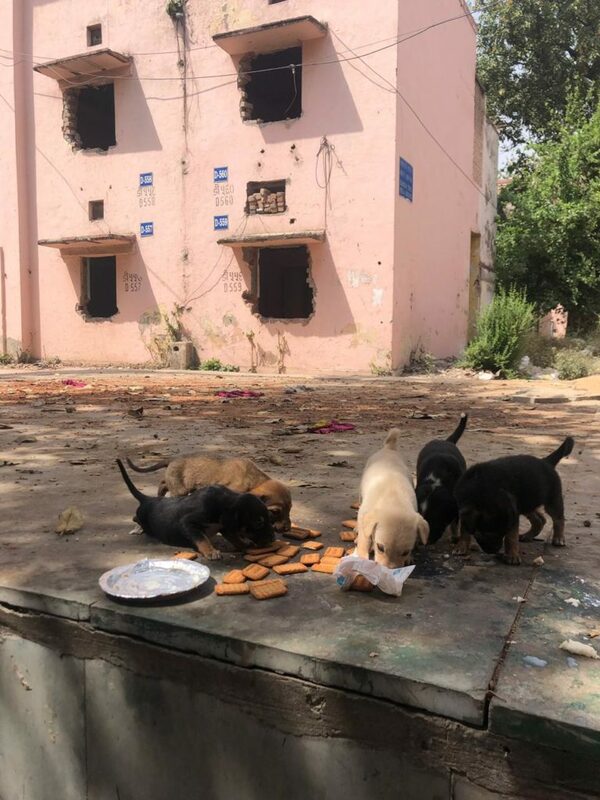 Proof that when we destroyed the delicate glass bowl of the Netaji Nagar community, among the shards, we also destroyed the ecology of urban animals who need human community for food, water, and even companionship. And what about water? All water pipes have been shut in the houses which are sitting, waiting like unwilling brides to be sacrificed to eventual bulldozers. Water has to be carried in bottles and containers of all forms and sizes. “Fill it fully” says Praveen as I try to save some in my personal water bottle, “I will fill it again in the evening!” She makes a stop at her old flat. Sofas, furniture thrown around like junk, it’s not a home anymore. The top of the stairs looks like a junkie’s stoop, but its not. Its her discarded small oil plastic bottles, and burned out diya, which she lights every night, for her cats and dogs, so they aren’t scared in the dark lonely flat. When people in power make plans for massive developments, which involve cutting thousands of old trees, do they ever think that in Delhi’s polluted air (which caused 12 lakh early deaths in 2017), IT’S ONLY TREES THAT GIVE US OXYGEN. Anyone who is trudging in heat lugging water buckets, cans, containers knows the relief of finding shade. That’s because trees reduce the heat island effect, reducing the temperature around them. They also reduce particulate pollution, and they conserve water. All desert people know that trees bring rain, cause rain and hold water. And a loss of trees brings dust and desertification. Even the Supreme court has warned that if we do not wake up, Delhi will run out of groundwater by 2020. Are our planners not worrying as we, the residents are, for our children’s future? Are the words “climate change” new to our governors and planners? Or has there been a deliberate suicidal plan hatched by the top 10 percent to not tell the public that we have limited time on this planet. Lest the 10 percent has to forgo some of their amenities. If people like Praveen were the planners they would devise a much more kinder future that would include people and animals and trees. But the reality is that people like Praveen are overwhelmed, and overstretched, spending all their money and desperately keeping the last semblance of humanity alive, by feeding and watering these animals. The discards of development…. We pass a cheery tribe of monkeys in a jubilant mood, someone has given them bananas. Whats the impact on them, and on squirrels, peacocks, birds, residents of the trees and lawns, or on the micro fauna and flora, the soil itself, as the buildings are destroyed and trees torn down? All structures and bonds will be destroyed, demolished, and concretised. What was a centrally-located, comfortable colony for lower and middle-grade government employees, will be “developed” into multi-storey, modern, fancy apartments serving upper-grade government classes. Cement wins, trees lose. Apart from depleting water reserves, the cement industry is also responsible for being one of the foremost producers of CO2 worldwide and a major cause of climate change. Trees, on the other hand, can save us from climate change. Again, development wins – our twisted idea of development, which is not sustainable, and which has created this crisis of climate change, in the first place. The basic 101 version of climate change is that all our CO2 and emissions are raising the temperature of the planet, which is already causing extreme climate events and will make the planet unlivable by the end of this century. All people lose, animals lose, insects are dwindling, rapid species extinction is underway worldwide. The UN climate report has warned the world – if we immediately reduce our emissions, and keep the temperature rise to less than 1.5 degrees, in the next 12 years, we may have a chance to survive. Stop cutting trees, stop using fossil fuels, stop concretizing the world. Now! And the powers-that-be are still debating transplantation (does not work), compensatory afforestation (does not work). 4 lakh trees slashed for an all weather highway, 50,000 trees for the metro, 17,000 hectares of Chattisgarh forest opened for mining, 800 football fields of dense forest cleared for Adani coal mining, Aarey forest in trouble, bullet trains through mangroves, ports with no environmental clearances, roads through Aravali forests, roads and trains through national parks, tigers killed for cement plants, elephant corridors blocked for tourism, Sohna road widening, Dwarka road widening, PLPA amendment, tree cutting permissions available for any residents in Delhi for a pittance. Its endless. Meanwhile, a sixteen year old Swedish girl Greta Thunberg, bunked school, protested outside the Swedish parliament, and unleashed a storm of youth protests across the globe. Strike for climate, treat climate change as a crisis, act now, there is no plan(et) B, dont bother to leave a will – some of their signs read! It is time for all of us, public and planners, to educate ourselves and wake up before there is no chance left to save the planet. “The aspirations of the people,” repeated a government electee, a misfit on an environmental panel organised last year to save these colonies and their trees from being felled. I think, the truth is more – the aspirations of a few, misplacing a vibrant and well functioning community, in full balance of its parts. Cats, dogs, trees, children, peacocks, small market – all thriving, on a much lower carbon footprint. Now, as the Government’s redevelopment agency NBCC smashes apart the inner machinery of this community, we see the parts strewn across the rubble, families, dogs, trees, invisible interdependent bonds shred. 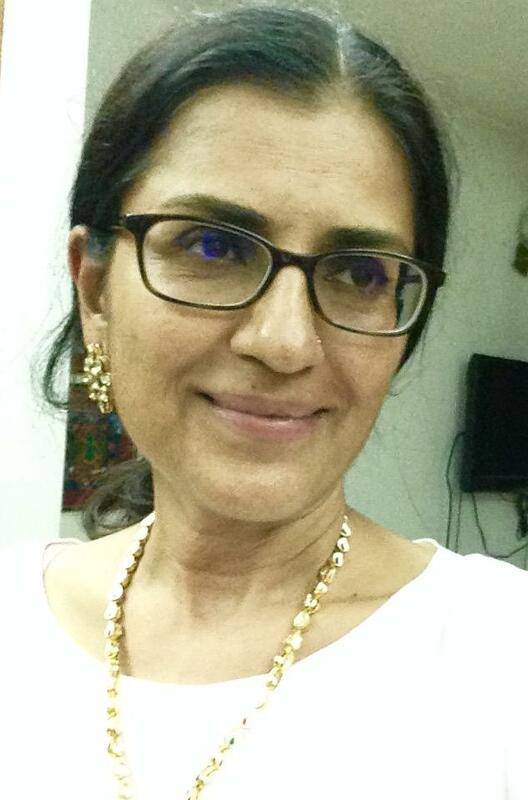 And nothing can put the shards of the broken-glass-bowl of Netaji Nagar back together again. Even the crows were hungry, and mounted a battle against the pups, for the milk-soaked bread in shiny foil-sided pattal plates, served by Praveen. “Come in the evening, then you will see them all,” she says, smiling angelicely, two more puppies in her hands, as we wave her goodbye. We left early, it was so hot, thank goodness for the remaining trees. What are our ministers even doing? They clearly are not fir for governing us. We teach all this in primary classes and till 12th. That how important trees are in our ecosystem and how vital the animal kingdom is. All these top people call themselves highly literate but I only see them as drooling toddlers, greedy for money and power, not caring who they hurt in the process. Its so sad! I hope we change this. We need a revolution! Hats off to the people trying to save animals nd environment. I think by the time humans realise that we are deeply interconnected to each species and plants in this universe it’s going to be too late to save our human race cause we would have destroyed everything that is needed for a sustainable living ! Complete gratitude to all the people who are helping this project in any which ways !